There are many beautiful beaches in East Timor, but discerning bathers should make a beeline for Jaco Islands, which is home to the country's finest golden sands. It's about six hours by car from the capital, but the journey cuts through beautiful forests and wends along scenic coastal roads. Looking for something a little closer to Dili? Then try Areia Branca and Dollar Beach. This small town is a few hours from Dili and notable for the fact that most inhabitants speak Tocodede, a language unique to this district of East Timor. Once in Maubara, visit the 17th-century fort. Once a prison, it has a substantial coastal wall with cannons still pointing out. This annual jamboree lights up Dili every April (or sometimes May, depending on the duration of the rainy season). Revellers don traditional costumes during the carnival and compete for awards, which are given out to the best dressed. The dancing and merriment goes on long into the night with live music and much more entertainment. As they retreated from East Timor, the Indonesians wrought carnage upon the town of Baucau. Yet its quaint, colonial charm still shines through and it remains a fine place to while away a few days. The city abounds with pretty Portuguese colonial architecture and visitors can explore caves used by the Japanese during WWII. There's also a pool, should you fancy cooling off. East Timor's colourful capital abounds with Portuguese architecture, which serves as a reminder of its colonial history. After independence the country was occupied by Indonesia and visitors can learn all about the country's struggle for sovereignty at the poignant Resistance Museum. Housed in a former prison, the Chega! Exhibition offers a grittier take on the struggle against Indonesia. Thrill seekers are well catered for on East Timor with a selection of mountains that make for world class trekking. The most notable climbs include Mount Matebian and Mount Kablaki in the Baucau district and Mount Ramelau in Ainaro. The breath-taking views are complemented by stunning wildlife that includes eight species of bird unique to Timor. Make a journey to Com, a beautiful fishing village, popular for weekend getaways. The main activities are fishing and snorkelling. The 20 sublime rooms of the Com Beach Resort are a sign of things to come, with talk of a real 5-star resort being developed in the future. 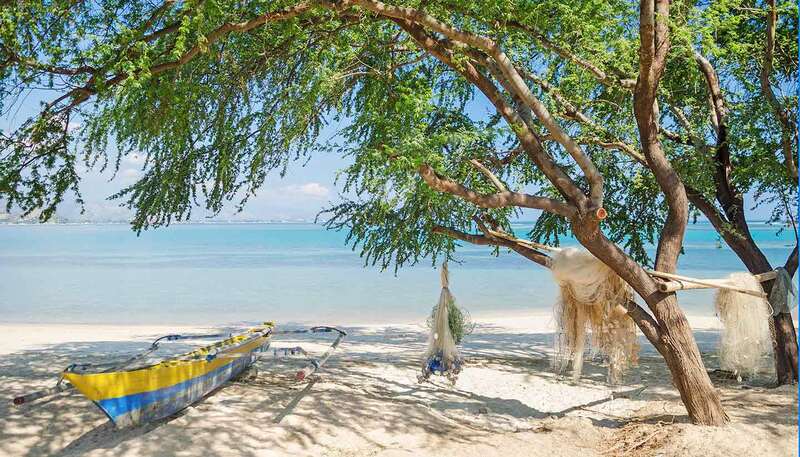 Tutuala is the region to head for if you like watersports and great beaches. Atauro Island and nearby Jaco Island offer excellent diving, snorkelling and birdwatching. Atauro (which means "goat") is now firmly on the map as an eco-tourism destination. Watch this space. Oecussi province belongs to East Timor politically, yet is a part of Indonesian West Timor culturally and geographically. Its capital, Pante Makassar is a sleepy little town that lies between the coast and the mountains. Coral reefs off coast offer spectacular diving and snorkelling. Mountain biking and hiking are possible in the interior or in the mountains.